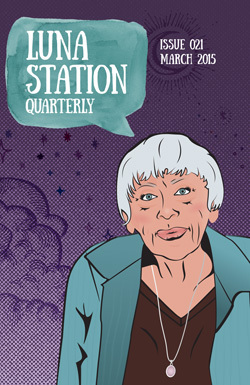 Welcome to year six of Luna Station Quarterly, and our first ever print issue! The women gathered between these covers, fresh and experienced voices alike, represent a marvelous cross-section of backgrounds, tones & genres. Fantasy & science fiction, from the personal to the mythic to the offbeat : it’s what our loyal readers have come to expect from Luna Station. Allons-y!